Lone Tree is an upscale Home Rule Municipality in Douglas County. There are plenty of opportunities to enjoy the great outdoors in style here. The many outstanding amenities are enjoyed by a population of approximately 11,852 residents within a total area of 1.7 square miles. Single family homes and condos are available in the area for singles and families. Approximately 63.2% of the local residential property were constructed between 1980 and 1999. About 36.8% of the houses and condos were built between 2000 and the present day. Lone Tree offers a variety of home sizes and floor plans. The median list price per square foot is $216, which is higher than the Denver area average of $175. The median price of Lone Tree homes currently listed is $612,950 while the median price of homes that sold is $383,846. The most popular floor plans in Lone Tree are between 2400 and 3600 square feet (38.6%) and 1800 -2400 square feet (25.2%) respectively. There are larger offerings of 3600 square feet or more and smaller floor plans available. Single family homes represent 72.8% of the residential units, while condos represent 21.3%. The market has stabilized somewhat in the area, but homes are still expected to increase in value this year. 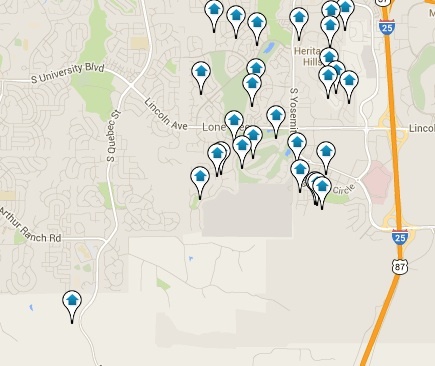 Presently roughly 12.1 % of the houses in Lone Tree presently sell beneath listing price. This really is a great time to check out the market in Lone Tree for an above average house at an attractive cost.